The children have been at school for just over 2 weeks now and have settled into the school routine well. We have already done so many activities such as: a listening walk around the school grounds, playing with the parachute, learning about musical instruments, playing number games, using the interactive whiteboard and the laptops. 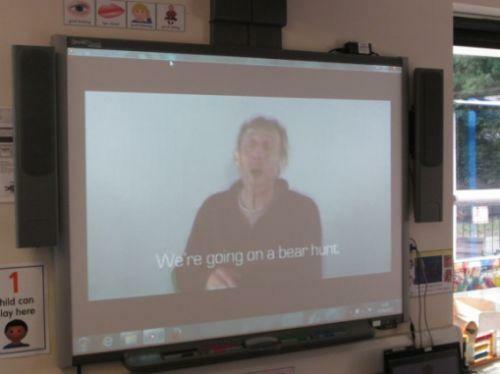 This week commencing 16th September, we have been looking at the story ‘We’re Going on a Bear Hunt’ by Michael Rosen. We have had so much fun learning this story! 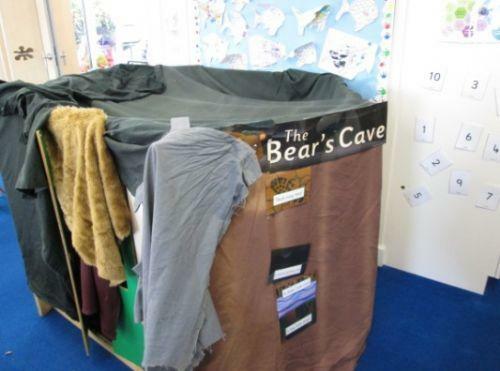 Mrs Wilkinson (Ash group Teaching Assistant) made the home corner into ‘The Bear’s Cave’ which we could go into and pretend to be the bear from the story. Some of us even made our own bear masks to use when we role played. Mrs Turrall (Ash group Teacher) had a special copy of ‘We’re Going on a Bear Hunt’ which had a DVD of the story. We enjoyed watching the animation and joined in with the parts we knew really well. We also went into the hall and did some drama where we acted out the story and tried to find the bear! We tip-toed into the cave and....surprise! There was the bear! Mrs Turrall showed us a video clip of Michael Rosen himself telling the story in a different way. We thought he was really funny! 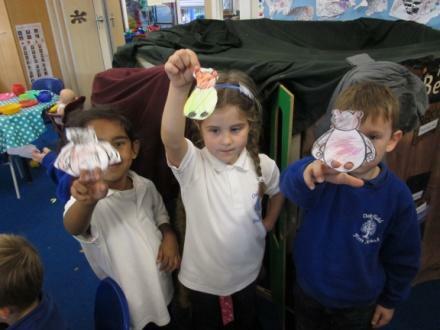 To finish it all off, we made our own bear puppets. When we had finished making the puppets, we took them into the cave with a torch. We experimented what happened to the bear when we moved it closer to the wall and then back out again. It made a big and small shadow. We have had a lot of fun learning the story of ‘We’re Going on a Bear Hunt’! Please visit back soon to see our other exciting activities we have been doing.